3/159 David Mumpower This is the best action film since The Bourne Identity. 14/200 Max Braden The best action movie of the year, Cruise gives an intense performance. 21/47 Amanda Jones Say what you want about Tom Cruise, this film was darned entertaining. 25/65 Kim Hollis Yeah, I'm saying it. Tom Cruise is a fantastic actor. Philip Seymour Hoffman is just the icing on the cake. 32/52 Les Winan Better than Mission: Impossible II but not as good as it thinks it is. Boy does Tom Cruise run a lot. The action is great and the cast is impressive. But something's still missing. "Mr. Hunt, this isn't Mission: Difficult, it's Mission: Impossible. Difficult should be a walk in the park for you." The second film in the Mission: Impossible franchise might not have been as memorable as the first one, but the catchphrase certainly was. 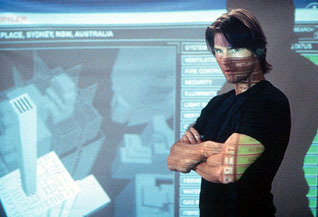 Tom Cruise's outings as Ethan Hunt have proven to be among the most lucrative in the Paramount Pictures library. The two films in the series have amassed over a billion dollars in worldwide receipts and much, much more in ancillary revenues from VHS, DVD and cable/network sales. As a linchpin of the studio, there is an understandable amount of protection given to future Mission: Impossible outings. This is particularly the case since the second film was widely regarded as a somewhat disappointing follow-up to the 1996 release. The problems in creating a third Mission: Impossible production are easy to understand but equally difficult to correct. The first film was a satisfying debut, but many movie-goers indicated confusion over the plot. While I maintain Brian De Palma's direction was top notch, tightly tracing the steps from the beginning through Ethan Hunt's endgame face-off with his former mentor, mine is by all accounts the minority opinion. The complexity of the script was such a concern that considerable effort was put forth to make the sequel much more accessible. Mission: Impossible II mirrored a James Bond flick by being much more a celebration of explosions and car/motorcycle chases than a plot-driven thinker. Fickle audiences promptly complained that the storyline was way too dumbed down, probably a valid criticism. So much meddling was done with the shooting script that by the time it was finalized, principal photography had been under way for a couple of weeks. As time went on, of course, the larger problem became the film's star himself. Cruise, known for being as consistent and charismatic a star as has ever existed in Hollywood, suddenly parted ways from his agent and hired his sister to replace her. Apparently, that former agent was the only person keeping him in check, because the star immediately seemed to undergo a transformation that has rendered him practically insane in the eyes of the public. Things started with Cruise's suddenly more vocal support of his religion, Scientology. From there an abrupt relationship began with Katie Holmes, a fact that seemed suspicious at the time as a potential public relations ploy since both Cruise and the new object of his affection had huge summer blockbusters in the making. After the scrutiny of the romance began, Cruise hopped on Oprah Winfrey's sofa and declared his love for the comely young lass, then proposed to her in Paris. It didn't end there, of course. Cruise's antics continued as he began a feud with Brooke Shields over her decision to take prescription drugs for her post-partum depression. As a Scientologist, he knew what was good for her, you see. Somehow, none of this had much effect on his summer 2005 film, War of the Worlds. The trouble is, Cruise stayed very much in the public eye over the next several months, allegedly impregnating Holmes. As it turns out, their child is born just days before Mission: Impossible III makes its debut in theaters - and on the same day that Brooke Shields gives birth herself. So at this point, all concerns about the movie's story do become secondary. Even so, Paramount put the project in wonderful hands as they hired Alias/Lost creator JJ Abrams to helm the film. Abrams enlisted the assistance of some of his show writers to handle the script. Given the craft with which he has been able to work in intrigue, clues and mystery, with Abrams, the franchise is in excellent hands. All he and his cohorts really need to do is expand on their Alias spy story experience to come up with something coherent and entertaining. See the latest developments for this project on the Mission: Impossible III Movie News page.